If you look closely at your Arduino, you'll see some pins labeled "DIGITAL",and some labeled "ANALOG". What's the difference? Many of the devices you'll interface to, such as LEDs and push buttons, have only two possible states: on and off, or as they're known to the Arduino,"HIGH" (5 Volts) and "LOW" (0 Volts). The digital pins on an Arduino are great at getting these signals to and from the outside world, and can even do tricks like simulated dimming (by blinking on and off really fast), and serial communications (transferring data to another device by encoding it as patterns of HIGH and LOW). But there are also a lot of things out there that aren't just "on" or "off". Temperature levels, control knobs, etc. all have a continuous range of values between HIGH and LOW. For these situations, the Arduino offers six analog inputs that translate an input voltage into a number that ranges from 0 (0 Volts) to 1023 (5 Volts). The analog pins are perfect for measuring all those "real world" values, and allow you to interface the Arduino to all kinds of things. Properties of Pins Configured as INPUTArduino (Atmega) pins default to inputs, so they don't need to be explicitly declared as inputs with pinMode() when you're using them as inputs. Pins configured this way are said to be in a high-impedance state. Input pins make extremely small demands on the circuit that they are sampling, equivalent to a series resistor of 100 megohm in front of the pin. This means that it takes very little current to move the input pin from one state to another, and can make the pins useful for such tasks as implementing a capacitive touch sensor, reading an LED as a photodiode, or reading an analog sensor with a scheme such as RCTime.This also means however, that pins configured as pinMode(pin, INPUT) with nothing connected to them, or with wires connected to them that are not connected to other circuits, will report seemingly random changes in pin state, picking up electrical noise from the environment, or capacitively coupling the state of a nearby pin. Often it is useful to steer an input pin to a known state if no input is present. This can be done by adding a pullup resistor (to +5V), or a pulldown resistor (resistor to ground) on the input. A 10K resistor is a good value for a pullup or pulldown resistor. There are 20K pullup resistors built into the Atmega chip that can be accessed from software. 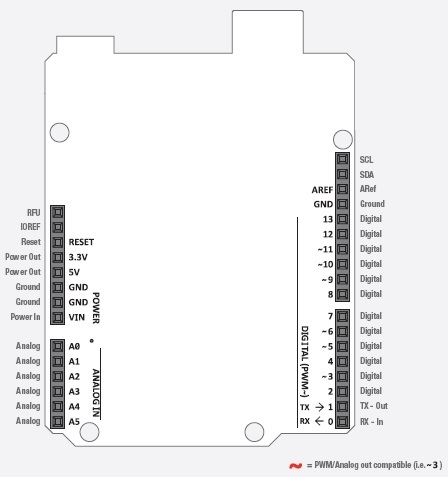 These built-in pullup resistors are accessed by setting the pinMode() as INPUT_PULLUP. This effectively inverts the behavior of the INPUT mode, where HIGH means the sensor is off, and LOW means the sensor is on. NOTE: Digital pin 13 is harder to use as a digital input than the other digital pins because it has an LED and resistor attached to it that's soldered to the board on most boards. If you enable its internal 20k pull-up resistor, it will hang at around 1.7V instead of the expected 5V because the onboard LED and series resistor pull the voltage level down, meaning it always returns LOW. If you must use pin 13 as a digital input, set its pinMode() to INPUT and use an external pull down resistor. Properties of Pins Configured as OUTPUTPins configured as OUTPUT with pinMode() are said to be in a low-impedance state. This means that they can provide a substantial amount of current to other circuits. Atmega pins can source (provide positive current) or sink (provide negative current) up to 40 mA (milliamps) of current to other devices/circuits. This is enough current to brightly light up an LED (don't forget the series resistor), or run many sensors, for example, but not enough current to run most relays, solenoids, or motors.Short circuits on Arduino pins, or attempting to run high current devices from them, can damage or destroy the output transistors in the pin, or damage the entire Atmega chip. Often this will result in a "dead" pin in the microcontroller but the remaining chip will still function adequately. For this reason it is a good idea to connect OUTPUT pins to other devices with 470Ω or 1k resistors, unless maximum current draw from the pins is required for a particular application. A description of the analog input pins on an Arduino chip (Atmega8, Atmega168, Atmega328, or Atmega1280). The Atmega controllers used for the Arduino contain an onboard 6 channel analog-to-digital (A/D) converter. The converter has 10 bit resolution, returning integers from 0 to 1023. While the main function of the analog pins for most Arduino users is to read analog sensors, the analog pins also have all the functionality of general purpose input/output (GPIO) pins (the same as digital pins 0 - 13). Consequently, if a user needs more general purpose input output pins, and all the analog pins are not in use, the analog pins may be used for GPIO. Be aware however that turning on a pullup will affect the values reported by analogRead(). The analogRead command will not work correctly if a pin has been previously set to an output, so if this is the case, set it back to an input before using analogRead. Similarly if the pin has been set to HIGH as an output, the pullup resistor will be set, when switched back to an input. The Atmega datasheet also cautions against switching analog pins in close temporal proximity to making A/D readings (analogRead) on other analog pins. This can cause electrical noise and introduce jitter in the analog system. It may be desirable, after manipulating analog pins (in digital mode), to add a short delay before using analogRead() to read other analog pins.